There has been much anticipation over the first formal concerto written for ukulele. For those not into classical music, a concerto is traditionally a composition of three movements in which a solo instrument is accompanied by an orchestra or concert band. Usually that solo instrument is one from the orchestra, like a trumpet, flute, clarinet or cello. The ukulele as a solo instrument for classical music compositions may be new, but master players such as John King have shown that the instrument holds its own in this genre. Speaking of master players, this particular concerto was written to be performed by Jake Shimabukuro. Jake hardly needs an introduction to the readers of this blog. 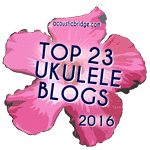 He is certainly among the world’s top players in terms of skill level and dedication to the ukulele specifically as a solo instrument. The composer is Byron Yasui, chair of the graduate music program at the University of Hawaii. This isn’t Yasui’s first rodeo – two of his orchestral works have premiered at Carnegie Hall and his compositions have received many prestigious awards. As an accomplished classical guitarist, the constraints and capabilities of the ukulele are not lost on him. This video preview of the event discusses some of the challenges for both player and composer. Yasui was able to balance the softer ukulele timbre with the large orchestra by amplifying the ukulele and through careful scoring. Most impressively, Yasui was able to achieve that balance without constraining the orchestra’s power. The opening of the second movement was like raindrops on a quiet afternoon, and Shi­ma­bu­kuro’s duets with harpist Constance Uejio were entrancing, his final delicate chord with harp and bells a gentle goodbye kiss. Shimabukuro’s cadenzas shone and his climaxes exploded, bringing the audience to a standing ovation. Before leaving the stage and the orchestra to finish with Mahler’s Symphony No. 1, Jake gave an encore of his composition Pianoforte in duet with violin. And so we’re left with the big question: when will the rest of us get to hear it?! I’ll update this post as soon as I find out, but for now no plans for a recorded release have been announced nor have additional performances been scheduled. If all this is too serious for you, take solace that this is not actually the first ukulele concerto to be performed. Yes, Jim Belof of Flea Market Music beat Jake to the punch on that one, and its quite a bit more lighthearted, as you might expect from Jim. And James Hill performed this little ditty (technically not a concerto, but still pretty damned good) with the Taipei Chinese Orchestra. The Concerto for Ukulele. . . is at the end of the second hour.